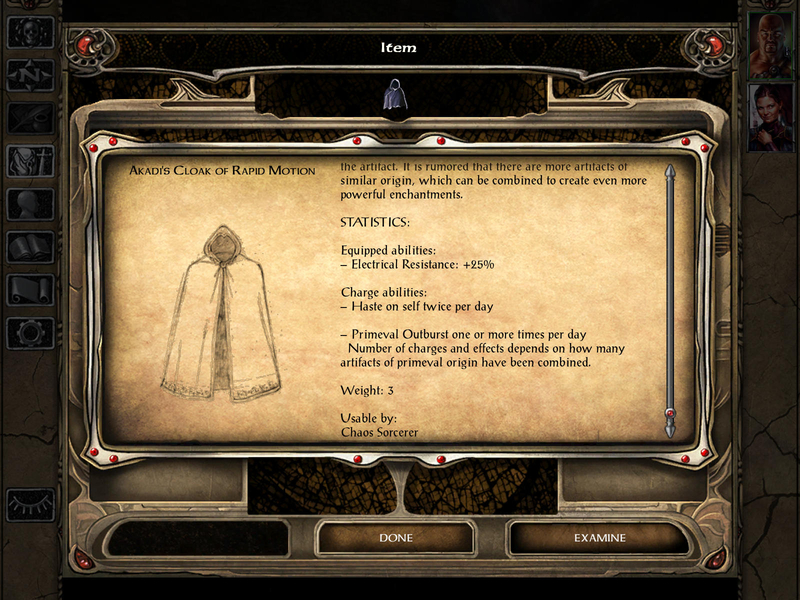 This mod introduces the "Chaos Sorcerer" kit which can be seen as the Wild Mage counterpart for the Sorcerer class. It is available for BG1:EE (with or without SoD), BG2:EE, EET (Enhanced Edition Trilogy) and IWD:EE. All patch versions are supported. The mod is currently available in English, German and Polish. Unlike Wild Mages, who struggle to comprehend the chaotic magic of damaged and distorted parts of the Weave, Chaos Sorcerers learned to derive their power from the Elemental Chaos itself a plane that is largely unknown to most inhabitants of Toril. The Elemental Chaos is a place of primeval entropy and discord, and not even the most seasoned practitioners can account for the inherent unpredictability of such forces. As a result chaos sorcerers have to rely on their agility and strong reflexes to slip out of the way of their own, often unpredictable, spells. Being exposed to this particular type of magic gradually increases the caster's resistance to all forms or magical energy. A basic understanding of the nature of Chaos is required to walk this most dangerous of paths. May cast the 1st-level spells Chaotic Weave and Surge Control (automatically added to spell list). May cast the 2nd-level spell Unluck (automatically added to spell list). May cast the 3rd-level spell Chaos Shield (automatically added to spell list). May cast the 5th-level spell Conjure Chaos Elemental (automatically added to spell list). May cast the 7th-level spells Nahal's Wildstrike and Conjure Greater Chaos Elemental (automatically added to spell list). 1st level: +1 bonus to Saves vs. Spell. 5th level: +1 bonus to Dexterity. 6th level: +1 bonus to Saves vs. Spell. 8th level: +5% Magic Resistance. 11th level: +1 bonus to Saves vs. Spell. 15th level: +1 bonus to Dexterity. 16th level: +1 bonus to Saves vs. Spell. 16th level: +5% Magic Resistance. 21st level: +1 bonus to Saves vs. Spell. 24th level: +5% Magic Resistance. Incurs a -2 penalty to Strength and Constitution. Alignment restricted to chaotic good, chaotic neutral and chaotic evil. May cast fewer spells per level per day. Upon casting a spell, there is a 5% chance of incurring a wild surge. WILD SURGE: A wild surge generates a completely random magical effect from the spell being cast. Its effects may be either beneficial or detrimental to the Chaos Sorcerer and his/her allies. 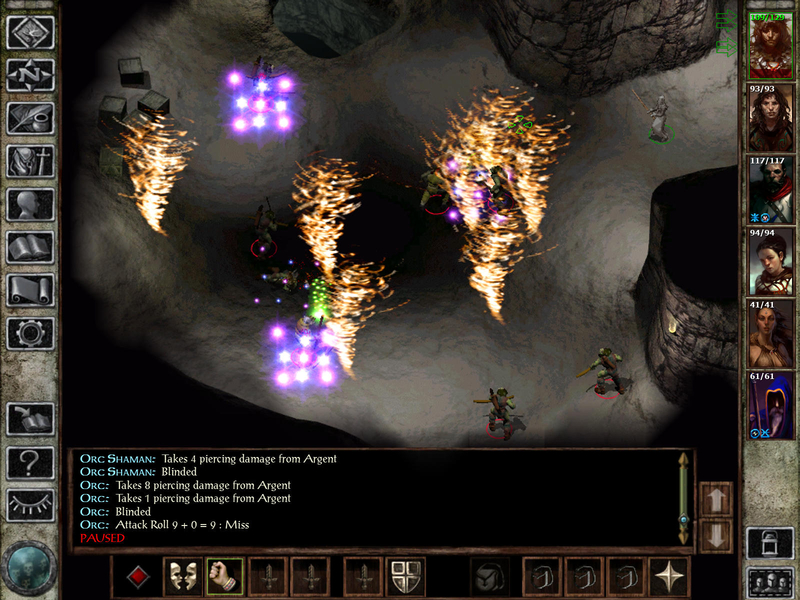 Casting level varies slightly whenever he/she casts a spellanywhere between five levels lower and five levels higher than the Chaos Sorcerer's true level. New level 1 spell "Surge Control" applies a slim chance to avert the next Wild Surge. New level 2 spell "Unluck" can be seen as the negative counterpart of the "Luck" spell. "Chaos Shield" merges with "Improved Chaos Shield" and becomes a level 3 spell that starts with a +15 wild surge bonus and improves to +20 and +25 at higher levels. New level 7 spell "Nahal's Wildstrike" surrounds the target with an aura of chaotic energies. Each time the target casts a spell will trigger a wild surge with unpredictable results. These additions are also available to the Chaos Sorcerer. However, "Nahal's Reckless Dweomer" is replaced by "Chaotic Weave". Feel free to post your thoughts, suggestions, questions or any bugs you encounter. Edited by Argent77, 06 November 2017 - 12:43 PM. The mod comes with a list of new or updated Wild Magic-specific spells (and a new HLA for the Chaos Sorcerer). This spell opens a small rift into the Elemental Chaos to draw raw magical energies from, which the sorcerer can attempt to shape into a desired spell effect. The attempt usually fails, but something almost always occurs in the process. To use Chaotic Weave simply cast it, then choose from a list of randomly picked spells. A burst of magical energy is released, which the Chaos Sorcerer will try to manipulate into the desired form. The actual effect of the spell is determined randomly by a dice roll on the Wild Surge Table (see the manual for more details). The list of potential spells to choose from becomes larger and more consistent at higher levels. Because the release of energy is planned by the Sorcerer, his/her level is added to the dice roll. If the result indicates success, the Sorcerer has shaped the magical energy into the desired effect. More often than not, the effect is completely unexpected. The result might be beneficial to the Sorcerer, or it might be completely disastrous: This is the risk the Sorcerer takes by relying on the energies from the Elemental Chaos. Casting this spell triggers a spell selection list that is randomly chosen from a pool of lists. Each variant focuses on certain spell ranges. Higher caster levels will improve the odds of producing more complete spell selection lists. Chaos Sorcerers are able to call forth beings from the Elemental Chaos to do their bidding. The Chaos Elemental looks like a haze of amorphous matter, swirling with no distinguishable pattern. It has 8 Hit Dice and will serve the caster's every whim until banished back to its home plane, the spell's duration expires, or the elemental dies. However, every time this spell is cast, there is a 15% chance that the elemental will escape the instructions of the caster and attack everyone in their vicinity. This berserking elemental will also remain until slain or the spell's duration expires. The elemental is locked into a psychic contest with the caster for 3 rounds after being summoned. At the end of this time, if the caster has won, he/she has control of the elemental; however, if he/she has lost, the elemental goes berserk and randomly attacks everyone around it. Even a fully controlled Chaos Elemental is unable to stand still for even a moment and will move around continuously unless given specific orders. However, it will always return to the caster if roamed too far. With this spell the caster creates a rift in the earth beneath the target and connects it with the Elemental Chaos for a brief moment. The process results in a massive eruption of various elemental energies that burn, eletrocute or freeze the target, and hold it for one round. The spell does 10d10 blunt damange and either 10d10 fire or cold damage, with a 50 percent chance of causing additional 10d10 electrical damage. The victim can save vs. spell for half. Finally, the rift into the Elemental Chaos draws the attention of creatures native to that plane. There is a small chance that a Chaos Elemental may slip through the rift and attack everyone in sight. Surge Control erects an invisible barrier around the caster that attempts to avert the next Wild Surge. The chance to ward off a Wild Surge is 10% + 1% per caster level, up to 30% at level 20. A successfully averted Wild Surge will neutralize the barrier, otherwise it will fade after 5 rounds. The barrier does not stack with other spells that increase chances of favorable results when Wild Surges occur. This spell affects the forces of chance around the target, giving it a stroke of bad luck for the duration of the spell. The target receives a -1 penalty to their Saving Throws, attack rolls, and minimum damage/healing rolls as well as -5% to all thieving skills. Furthermore, damage dice for all effects outside a weapon's base damage is increased by 1. For example, a 6d6 fireball will do 7d6 damage, and a flaming long sword that deals 1d8+2 slashing plus 1d3 fire damage will deal 1d8+2 slashing plus 1d4 fire damage instead. There is no Saving Throw for this spell, although magic resistance may stop it. Chaos Shield increases a Wild Mage's chance to gain a favorable result when a Wild Surge occurs. Every time a roll is made on the Wild Surge chart, an extra bonus is added to the dice roll. Bonus starts at +15 and increases to +20 at level 10 and +25 at level 20. The bonus from Chaos Shield stacks with the caster's level bonus. This spell surrounds the target with an aura of chaotic energies that latches onto each spell the target attempts to cast. For the duration of the spell, each time the target casts a spell will also trigger a wild surge with unpredictable results. Creatures can save vs. spell to avoid the effect, but do so with a -4 penalty. The subcomponent "Add Primordial Artifacts" scatters several powerful artifacts all over the game. Each item is dedicated to a specific primordial and grants some unique abilities to the Chaos Sorcerer. The items can also be combined with each other to unlock many more powerful and destructive spell-like abilities, ranging from a harmless Fire Blast over a Sandstorm to an all-destructive Armageddon. Edited by Argent77, 21 October 2017 - 05:02 AM. Added compatibility section to readme. Changed spell description of Chaos Shield to be more universal. Worked around an issue with Spell Revisions that made NRD a forced spell choice for Chaos Sorcerers. DEX bonus doesn't show as "green number" in Record Screen anymore. Added new subcomponent: Add "Primordial Artifacts"
This is a quick bugfix release. Last version didn't properly add one of the primordial artifacts to an SoD area. It will also fix some minor issues with starting equipment if you start a new character in SoD or ToB. Nice mod, does this use BGEE exclusive resources or it could potentially be altered to work on a classic (non EE) install? It's pretty much impossible to do this in the nonEE game as the change class is still a little janky in the game, as you can't make a Sorcerer/Mage kits, you need to make a different class one and have a spell that converts the characters class and kit to what ever the end result would be. It's a mess. This is experience speaking. Edited by Vonburen, 22 October 2017 - 06:07 AM. 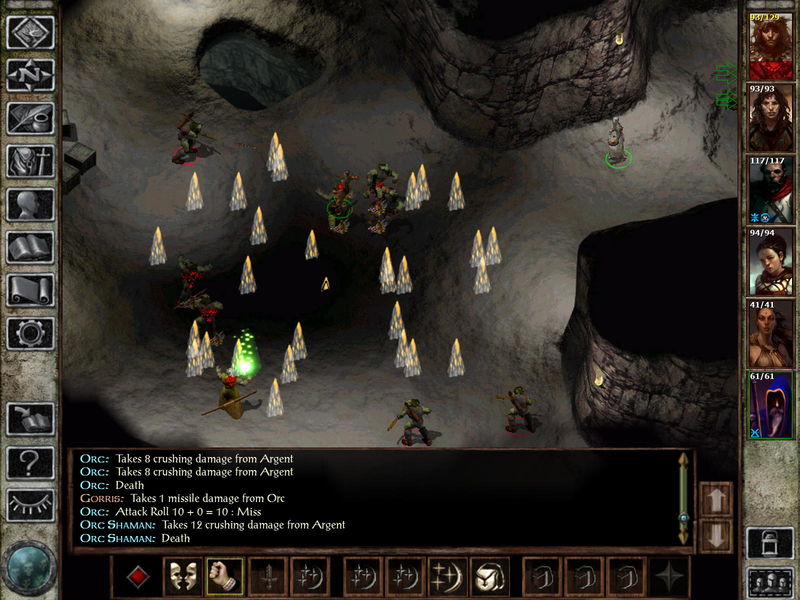 Porting the spells shouldn't be too much of a problem, since effect opcodes (with one or two exceptions) are also supported by the classic game engine. However, I don't think it's possible to port the kit itself for the reason The Imp already mentioned - classic BG2 doesn't allow kits for the Sorcerer class. Increased duration of spell "Conjure Greater Chaos Elemental"
Improved IWD:EE spell icons for "Conjure (Greater) Chaos Elemental"
Greatly improved and rebalanced spell "Chaotic Weave"
Rebalanced duration of "Chaos Shield". Improved combat scripts of (Improved) Chaos Elementals: Don't auto-attack charmed party members. Removed an unneeded spell table from "Chaotic Weave". Fixed script references to "Nahal's Reckless Dweomer", which caused issues with Neera's ToB quest line. How did you apply the random wild surge effect for miscasting? I am trying to do a conversion of the old wild-shaper kit into BGEE and need to work out how you make the new kit use the wild surge table. The kit uses the same KITLIST.2DA UNUSABLE code as wild mages, which is apparently enough for the game to apply all the wild mage traits, such as 5% chance of wild surge per regular spellcasting. However, I had to jump through several hoops to work around the remaining (and unwanted) hardcoded stuff, like wild mage spells.